As the population of the world grows, more mouths to feed means more land needed for agriculture. Where will the land come from? From the denudation of forests, of course. Rather than focusing on sustainable forms of vegetable farming, the modern farming industry continues to promote animal agribusiness. Raising animals for food results in massive amounts of forest destruction. It takes 12 times as much land, 13 times more fuel and 15 times more water to make a pound of animal protein than to make a pound of plant protein. Once found all over South-East Asia and even the far reaches of Southern China, orangutans have found themselves squeezed to just the two islands of Sumatra and Borneo. The great red-haired apes have been around for almost 400,000 years, but have seen their numbers dwindle alarmingly from over 200,000 a century ago to only 45,000 presently. The habitats of this iconic animal have been pushed to the rain forests in the northern fringes of the Sumatra island of Indonesia and just the south-eastern part of Borneo. People have been deforesting the Earth for thousands of years, primarily to clear land for crops or livestock. Although tropical forests are largely confined to developing countries, they aren’t just meeting local or national needs; economic globalization means that the needs and wants of the global population are bearing down on them as well. Direct causes of deforestation are agricultural expansion, wood extraction (e.g., logging or wood harvest for domestic fuel or charcoal), and infrastructure expansion such as road building and urbanization. Rarely is there a single direct cause for deforestation. Stretching out from the equator on all Earth’s land surfaces is a wide belt of forests of amazing diversity and productivity. Tropical forests include dense rainforests, where rainfall is abundant year-round; seasonally moist forests, where rainfall is abundant, but seasonal; and drier, more open woodlands. Tropical forests of all varieties are disappearing rapidly as humans clear the natural landscape to make room for farms and pastures, to harvest timber for construction and fuel, and to build roads and urban areas. Deforestation causes drastic loss of tropical forest biodiversity, and most deforestation occurs due to animal agriculture. Remaining areas of undisturbed and recovering forest provide the last refuge for many species unable to withstand the impact of human activity. As one of the most comprehensive surveys of the impacts of disturbance on tropical forest biodiversity ever conducted, an international team of scientists found where forests had been cleared for animal agriculture, plant and animal life was impoverished. Forests are vital for the health and well-being of humans, wildlife, and the Earth. They provide habitat for about two-thirds of all land-dwelling animals and plants. Around the world, these critical ecosystems are being ripped apart as a result of a booming demand for furniture, flooring, lumber, and other building materials. Trees are used to make paper, packaging materials, pencils, fuel for cooking and heat, and other wood-based products. Tropical forests are home to more of the world’s terrestrial biodiversity than any other habitat and are increasingly threatened by the impact of human activities. Illegal logging, in particular, poses a severe and increasing threat to tropical forests worldwide. The devastating impact of illegal logging on bird communities is especially damaging. The level of legal and illegal logging has increased dramatically, greater than maximum sustainable rates. As a result, the abundance of forest understory bird species is declining. Strategies for preserving tropical forests can operate on local to international scales. On a local scale, governments and non-governmental organizations are working with forest communities to encourage low-impact agricultural activities, such as shade farming, as well as the sustainable harvesting of non-wood forest products such as rubber, cork, produce, or medicinal plants. Parks and protected areas that draw tourists—ecotourism. About 600 miles off the coast of South-Eastern Africa lies the fourth largest island in the world, Madagascar. Famed for its lush green tropical forest, misty highlands, temperate climate and 3,000 miles of coastline, this jewel in the Indian Ocean is home to one of the most exotic creatures in the world – the lemurs. Madagascar's 160 million years of isolation as a landmass has shaped an ecosystem and habitat that's perfectly suited and unique to the existence of lemurs. Many factors affect forests including logging, urban sprawl, human-caused forest fires, acid rain, invasive species, and the slash and burn practices of swidden agriculture or shifting cultivation. The loss and re-growth of forest leads to a distinction between two broad types of forest, primary or old-growth forest and secondary forest. There are also many natural factors that can cause changes in forests over time including forest fires, insects, diseases, weather, competition between species, etc. The World Resources Institute recorded that only 20% of the world's original forests remained in large, intact tracts of undisturbed forest. More than 75% of these intact forests lie in three countries - the boreal forests of Russia and Canada and the rainforest of Brazil. Forest are great storehouses of natural life. Nearly half of our forest are now gone. We must act now to save the earth's forest. You can help by reducing, reusing, recycling & refusing to purchase paper and wood products that that are not ecologically responsible. Every ton of paper that is recycled saves 17 trees, 4100 kilowatts of electricity, 7000 gallons of water and 90 cubic feet of landfill space.1. Volunteer for tree-planting projects. Millions chimpanzees once thrived in the forests of 25 different African nations. Today, their populations have been reduced to only 5 nations and their numbers have plummeted to between 150,000 and 300,000. 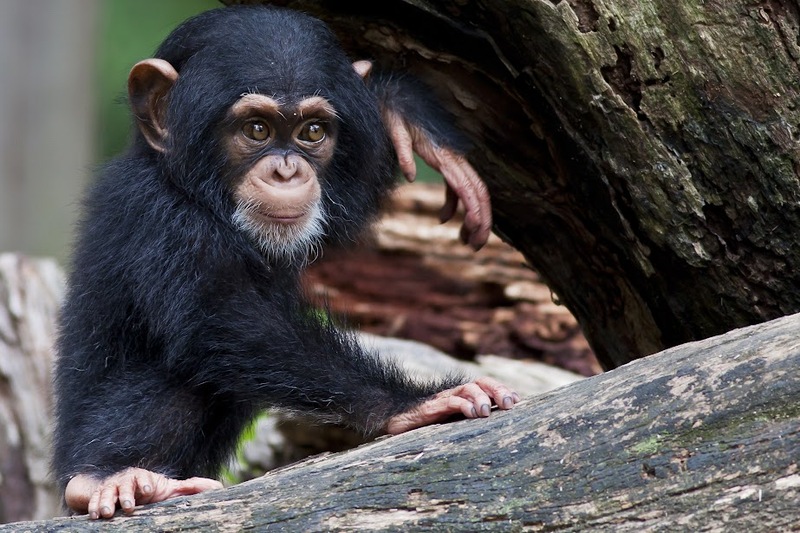 Without immediate action, humans' closest living relative could be lost in only 15 years. Humans are largely responsible for chimpanzee population declines. In addition to poaching, which plagues areas of Africa, deforesting and farming are quickly eliminating the habitats of chimps. With its cuddly stout body and large paws, the koala resembles a small teddy bear. The koala bear is an Australian icon and its habitat is exclusively confined to the coastal eucalyptus forests in the North-western and South-eastern parts of the country, spread over the states of Queensland, New South Wales, Victoria and South Australia. While eucalyptus leaves are poisonous to many animals inhabiting this region, to the koala it forms an essential part of its diet. The jaguar is the third-largest animal in the cat family, after the tiger and the lion. Dating back to almost half a million years, the jaguar strode the entire length of the American continent from just below the Arctics in the north down to Patagonia in southern-most Argentina. But sadly, it has found its present day habitat restricted to the tropical jungles of Central America and Amazon in South America. This translates into a habitat loss of almost 40%. Not a single jaguar has been spotted in the US in the last half a century.